The Ritz-Carlton, Abama is the most prestigious resort on the Canary Island of Tenerife. The terracotta citadel, built in a Moorish-style, is absolutely enchanting. With Atlantic Ocean views across to the island of La Gomera and a thrilling collection of holes, Abama is a modern European course destined for success. I first came across this new Dave Thomas-designed course in May 2005 when it had just opened. You’ll part with a green fee that is around double what you would pay at other courses in Tenerife but believe me, it is worth every cent for a superior golfing experience. Up until then, I had never used a buggy on a course before but such is the terrain, with substantial changes in elevation throughout, that Abama’s GPS buggies are an absolute necessity. It’s evident that some real resources have been spent on making the course look as if it has been there for a long time – from immaculate tee boxes to velvet like greens, from lush fairways to concreted cart paths, this place has class stamped on it throughout. There are thousands of palm trees on the property and a couple of dozen lakes strategically placed to come into play – especially on the signature par 5 10th where the elevation changes dramatically from the elevated teeing areas downhill, past lakes and waterfalls on the left and bunkers on the right, to a green doglegged on the left – simply a stunning hole that will last in the memory for a long time. The hotel was still being constructed when I first played but it has now been built to the same 5-star luxury standard as the massive clubhouse. One of the greens was under repair when I played because there was a professional event being held soon but when I replayed the course in 2010 all the greens were in pristine condition. 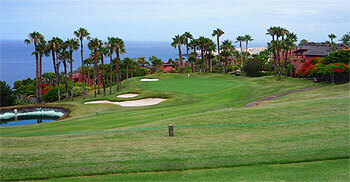 The Abama Open de Canarias European Tour event was the first professional competition hosted by Abama in October 2005 and England’s John Bickerton claimed first prize after carding a four round total of 274 to win by five shots. The following year, Rikka Hakkarainan from Finland clinched her maiden victory on the Ladies European Tour in the 5th Tenerife Ladies Open, holding off Spain's Tania Elosegui Mayor by two shots. Visiting holidaymakers who love their golf should travel the extra few kilometres from the established golfing zone around Las Americas to play here, as it is a wonderful venue for the more discerning golfer. There's little question that Abama provides a regal view -- the Atlantic Ocean in full sight from the clubhouse and the Ritz Carlton provides all the key amenities associated with top tier travel. The Dave Thomas course does require buggy usage because of the severity of the terrain. With the amount of elevation change the player must be able to adjust accordingly. For someone who is playing the course for the first time it pays to move up at least one tee box and play cautiously because of the narrow landing area and the close proximity of out-of-bounds on a number of the holes. This is the kind of course where the difference between one's first round and a return effort can easily be several shots. Abama is a much tougher layout than many resort oriented courses and much of this is tied to the elevation changes encountered. The green sites are also hard to approach because of the land movements. The ending holes on both sides are demanding because the shotmaking must be flawless. The downhill 8th and 9th holes are akin to an action movie. Unless you are truly dialed in it's quite easy to make a serious donation to one's golf ball budget. The inward half of holes is not as dramatic as the front side but the hole quality is much more consistent. The ending stretch -- featuring two quality par-4's at the 16th and 18th -- give nothing away and are especially good. One can only imagine the costs to build Abama because the course is literally on the side of a massive hill. For those who are traditionalists at heart they may scoff at the layout as being nothing more than a golf amusement park with walking clearly not feasible. Such a view is a bit much. There are clear standout holes at Abama and given what's available on Tenerife it's worth playing to see what all the commotion -- pro or con -- is about. Played 2 rounds here in November and even as hotel guests the fee was €160/ person - so it is roughly twice as much as other courses! I'm afraid it looks better from the clubhouse than it plays... obviously millions more were spent on building this than any other course on Tenerife....but that doesn't guarantee enjoyment although the terrain does account for this perhaps. I counted 14 shots across the 18 holes which are either blind or where you cannot see the surface of the green, off the tee however it's not too bad.The elevation changes are severe and I generally dislike hitting into greens where you have to guess the shape of the surface. Yes the buggies have sat nav but it gives only a rough picture. I also witnessed playing partners putting off greens because in many places the slopes were severe - it just spoils enjoyment. I don't wish to be a golf snob but we often get paired in Spain with couples that are very pleasant but have handicaps in the 24+ range - and witnessing their efforts this course in particular could never bring enjoyment- it's too tricky. All in all we much prefer Adeje and Las Americas. A fair review and much more in line with my thoughts on Abama. The earlier 2-ball review was too harsh. Not my cup of tea and can't agree with earlier comments. As a vistor, if you can't stand on the tee and see what you are supposed to do, in my opinion, it's a poor design. I can understand that the terrain limits the options, but when your eyes see an uphill putt that end up 30 yards off the green is not my idea of enjoyment. Playing off a hcap of 5 I believe I'm a reasonable golfer and fairly proficent at most aspects of the game, but this course needs several practise rounds to learn the layout. Not that I feel too strongly about it, but if I had courtsey of the course I still wouldn't waste my time on this tricked up track! This is a very harsh review in my opinion. I’ve played Abama twice before and found the greens very tricky but not as wild as say the Castle at St Andrews. I can’t recall any blind drives at Abama unlike many old fashioned courses. Put me down as a fan of Abama and a golfer who thinks this 2-ball rating is off the mark. I played the Abama course on a warm sunny day on the 10th November 2010, my father had played there before and said I was in for a treat and he wasn’t wrong! Quite simply this is one of the most beautiful courses I have ever played, and without question is also one of, if not the hardest I have played. Being single figure handicappers we played it off the white tees which were playing over 600 yards longer than the yellow tees and on certain holes you really noticed the difference, it wasn’t uncommon to be hitting long irons or 3 woods for our 2nd shots on par 4’s and I would class myself as a reasonably long hitter of the golf ball, it tested me to my limits and was all the more enjoyable as a result. The views you get of the Atlantic are incredible and it’s difficult not to get distracted on most of the holes. The condition of the course was superb and the greens were very true and fast, and no matter how many times I allowed for the break towards the ocean I still managed to misjudge just how much break there was, some of the breaks are so subtle you can scarcely believe it. Off the whites 3 of the par 3’s were playing over 200 yards long so we invariably had over 30ft putts for birdie (or par!) which were made all the more difficult by the breaks and speed of the greens. Some of the landing areas off the tee are so narrow with sloping fairways and out of bounds that I decided to hit 3 wood off most of the tees, you can certainly get away with driver but as I said certain holes have narrow landing areas with well placed bunkering, it is definitely a course you have to plot your way round. Buggies are compulsory which I don’t normally like but there is no way you could walk the course, it is very hilly in places and some of the distances between green and tee are a fair distance. Certain holes had fresh fruit on the tees which was a nice touch. This is an expensive course to play at 200 euros but in my opinion is worth every penny, the views alone justify the price tag and fortunately they are backed up by a superbly conditioned golf course where no two holes are the same and if I could play this course every week my golf game would improve significantly, not to mention it was a benign day when we played and can only imagine how difficult the course plays when the wind is up! In terms of challenge and playability I would rate this along with any of the Top courses I have played in the UK, and given half a chance I would take the 4 hr flight to Tenerife just to play this course again, superb! I returned five years after my first visit to see how the course was looking half a decade on and it didn't disappoint in any shape or form. The opening trio of holes takes you away from the clubhouse to the stunning par three 4th – a hole that had somehow escaped my memory from last time. Emerging from a dark tunnel to a sunny elevated tee position looking across a shimmering lake to a distant green, I imagine most golfers will do as I did, mouth a rather loud "wow!!!" as they take in such a fantastic visual treat. Not that the thrills end there because there's another three marvellous downhill holes to hurtle down towards the hotel, one after the other from the 8th. After the visual sensory overload on this stretch, the remainder of the course plays a little more sedately in comparison (par fours at 11 and 13 excepted) with the final four fairways laid out along the hillside, playing in opposite direction to each other as you gradually ascend again to the clubhouse. Because Abama goes the extra mile (apart from leaving out trays of freshly picked bananas and wooden cabinets of ice-chilled water bottles on a number of tee boxes) like having white plastic liners on the top of the holes to give that professional, tournament-look when putting out you can understand why they charge a premium green fee for what is a premium game of golf on a wonderful resort layout. One word for me sums up Abama… “Oasis”. It’s a slice of tropical heaven in an otherwise barren volcanic landscape. Atlantic seaward views are stunning with the island of La Gomera as the backdrop with its surreal cloud-shrouded volcanic peaks. Inland the views are bleak and barren while the course and the incredible hotel are set in glorious tropically landscaped gardens which will no doubt improve year on year as the flora matures. Dave Thomas designs do not normally get my personal pulse racing, but many of the holes here at Abama are dramatic with elevated tees, ravines and even Disney-like water features. The whole experience is five-star with GPS satellite systems in the carts to fresh oranges and bananas on the tee boxes. The course itself is manageable for the handicap golfer with a number of tees to choose from. I’ve not played much golf this year and elected masochistically to play from the back markers and managed a nearly respectable score which would have been good had I mastered Thomas’s huge and very tricky greens. As Jim quite rightly points out in his nomination article, it really is a superior experience and a heavenly location.